Villa Anna is a modern four bedroom luxury villa, which is situated on the 2nd line from the sea front in the Corralejo resort in Fuerteventura. It is in an excellent location, being only a 2 minute walk to the famous sand dune beaches and it enjoys panoramic sea views of the islands of Los Lobos and Lanzarote from several rooms as well as from the roof terrace. The villa has a private pool which is electrically heated. Access to the pool is via roman steps. The villa also has a natural salt chlorinating system, which reduces the amount of chemicals used and therefore the risk of skin and eye irritations. The pool is surrounded by plenty of sun loungers and sun umbrellas and there is also a Canarian barbeque and a patio table and chairs for alfresco dining. The whole villa is surrounded by a high wall, which offers a good level of privacy. Stairs lead up to the roof terrace where there are more sun loungers and fantastic sea views. The villa is laid out all on one level. The lounge is furnished with comfortable leather sofas with a 40 inch flat screen TV and satellite channels. There is a separate dining area with seating for 8 people. The modern kitchen is very well equipped with all the usual kitchen appliances with a separate breakfast room. The master bedroom has a double bed with ensuite bathroom. The other bedrooms are twin rooms which share a family bathroom with a jacuzzi bath. One of the twin rooms has patio doors which lead out to the pool area. Both the master bedroom and the lounge have ceiling fans. There are sea views from several rooms in the villa. A card is not considered essential for staying in this villa. Want to know where to stay in fuerteventura. 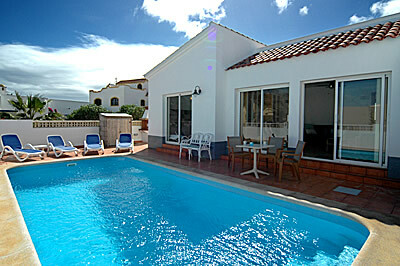 Check out this lovely villa in Corralejo, which has a heated pool and a jacuzzi.